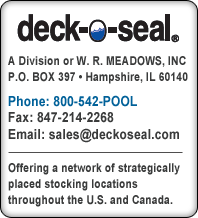 Hampshire, IL – DECK-O-SEAL, a division of W. R. MEADOWS offering pool deck products, offers DECK-O-SEAL GUN GRADE for swimming pool projects above and below the waterline that require a short turn-around time. DECK-O-SEAL GUN GRADE is a premium quality, two-component, non-sag, non-flowing, polysulfide-based sealing compound. It is ideal for sealing joints including pool bottoms, sidewalls and areas with high pedestrian traffic. All submerged applications must be primed with P/G PRIMER from W. R. MEADOWS. DECK-O-SEAL GUN GRADE is non-staining and cures to a firm, flexible and tear resistant rubber. It is highly resilient with excellent recovery characters and outstanding resistance to most chemicals, all weather conditions, aging and shrinking. Supplied in unitized, pre-measured packaging, DECK-O-SEAL GUN GRADE is ready for instant blending and easy application for several general purpose caulking applications. In addition, DECK-O-SEAL GUN GRADE contributes to LEED credits for Low-Emitting Materials and Regional Materials.